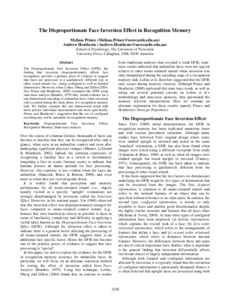 The Disproportionate Face Inversion Effect (DFIE), the finding that inversion disproportionately affects face recognition, provides a primary piece of evidence to suggest that faces are processed in a qualitatively different way to other visual stimuli (i.e., along configural as well as featural dimensions). However, when Loftus, Oberg and Dillon (2004; also Prince and Heathcote, 2009) examined the DFIE using state-trace analysis (Bamber, 1979) they found evidence for a one-dimensional encoding of unfamiliar faces when inversion only occurred during the study phase of a recognition memory task. We further examine this one dimensional result with more precise individual measurement and more specifically, Prince and Heathcote’s suggestion that the use of configural encoding may not be automatic in recognition memory.